Back pain due to a herniated disc and treatment with Chiropractic and Spinal decompression patient testimonial. “Have you had an MRI of your back to see if you have a herniated disc?” “No”, I said. I had always had a suspicion that I may have had a herniated disc by my symptoms but had previously brushed the thought aside. Q: I have a herniated disc in my lower back, is surgery the only option to fix it? A: A herniated disc can be a scary diagnosis for anyone especially if you are active. If you are unfamiliar with what a herniation is, it’s when the jelly like substance in the discs between your vertebrae bulges out between your vertebrae. Many people are unaware they have a herniated disc as it often just feels like a pinching in their back or it feels like inflammation or a muscle spasm. A herniation is a major problem because if left untreated, it will worsen over time and will eventually cause your vertebrae to rub together and degenerate. The sooner you can determine if you have a herniation and the sooner you seek treatment, the better. The best way to do this is to go for an MRI, especially if you have continual back pain. The traditional medical model involves medication to reduce inflammation and analgesics to reduce pain as well as physical therapy to strengthen core muscles, but this is just a short-term solution. While surgery was originally thought to be the only answer for severe herniation, fortunately, a fairly new treatment has been used that is non-surgical. This treatment not only decreases pain but also helps to restore the discs height and reduce the disc herniation. The therapy is called spinal decompression, which is a treatment that is a non-invasive and has been utilized worldwide with an impressive success rate close to 90%. When this method is combined with chiropractic care and a physical therapy program designed to strengthen Core muscles, the results are impressive. Spinal decompression involves specialized equipment that gently lengthens the spine, which helps create a vacuum at the injured disc level. This vacuum allows the disc material to return to its normal position. 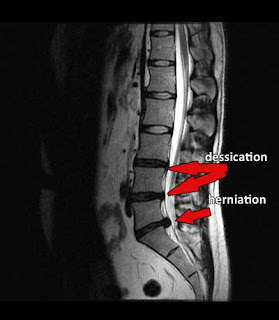 If you are diagnosed with a herniated disc it is in your best interest to learn more about spinal decompression therapy and to speak to a qualified doctor to see if this treatment is right for you.